Networking events have been part of the business scene for as long as anyone can remember and will continue into the foreseeable future. Even in the modern age of social media marketing, face to face business networking is still an excellent way to establish relationships with potential clients and increase your sales. Here are some networking tips and tricks for you to help make your next business networking event a success. When you arrive at a networking event, avoid gravitating to people you know. You should initially thank the host and then immediately find someone new to introduce yourself to. This will help keep you in the right frame of mind as to why you came. Stop selling and start listening! When you meet someone for the first time, use it as an opportunity to get to know them. Don't try to sell them anything. Rather, begin to establish a relationship. Keep your business cards in the breast pocket of your coat, a shirt pocket, or in an outside pocket of your purse so they are easy to access and in good condition. The same with your mobile phone—if the other party has a compatible device you can exchange contact info instantly via apps such as AirDrop for iOS. When giving a person your card, personalize it by hand writing a note or additional contact information on it. This will cause the recipient to feel that they are receiving something special. When giving or receiving a business card, be especially careful when dealing with people from outside North America as many cultures treat them with very high regard. In many Asian countries, the exchange of business cards is an important ritual, for instance. When receiving a business card from someone, take a moment to write yourself a note on it, such as where you met. If you do this while you're still talking to the person, it will help convey your sense of personal connection. During the course of a conversation at a networking event, use the other person's first name two or three times. People always like to hear their own name and it will help you to remember it when the discussion is over. The best business networking tip: rather than telling a new contact all about yourself, spend your time asking them questions. It's amazing how much you'll learn. After you meet someone for the first time, use the back of their business card to jot a note about something you learned from the conversation and the date and place you met them. Alternately, enter the information into your mobile device; a mobile Customer Relationship Management (CRM) app is ideal for this purpose. Recording the information will give you something to talk to them about the next time you see them. Connect with the person you're talking to by tilting your head as you listen to them. It is an effective body language technique which communicates that you're paying attention to what they're saying. When a person is talking to you be sure to look directly at them. Giving a person full attention with your eyes will encourage them to share more. When giving someone eye contact, remember it's not a "stare-down" contest. Give the person three to five seconds of eye contact and then look away briefly before returning your focus to them again. 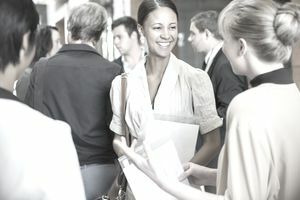 The best location for networking is by a high-traffic area such as a main door, the bar, or near the food. Never approach someone if they are walking toward the restroom or if they have a phone in their hand. Wait until they have returned to the networking area or put their phone away. After the person has shared something with you, ask them another question about what they just said. This shows that you're paying attention and that you care about what they're telling you. Always keep one hand free to allow yourself to shake hands with people. This means that you shouldn't eat and drink at the same time. Remember, you're there to network, not eat a full-course meal. As a way of demonstrating your networking skills, introduce each new person you meet to at least one other person. Never try to barge into a group of four or more people. Come along side of the group, but do not attempt to enter into the discussion until you've made eye contact with everyone and a minimum of two other people in the group have said something. Do not approach two people who are talking, as you may be interrupting an important discussion. Initiate conversation with someone who is standing by themselves. They'll be happy to have someone to talk to them and, as a result, will many times open up with valuable information. When you meet someone for the first time, you have 48 hours to follow up with them before they will completely forget about meeting you. A networking event is not a time to see how many business cards you can acquire. Rather, it is a time to develop a few relationships that have potential. When attending an event, it's important to have the perspective that your goal should be to help others first. Unfortunately, it's an old cliché that is often left at the door. The next time you're headed to a networking event, keep in mind the following simple, helpful rule: after it's all said and done, you want to have earned the right, privilege, honor, and respect to be able to meet with them again. This is not a license to sell yourself, but an opportunity to build relationships.